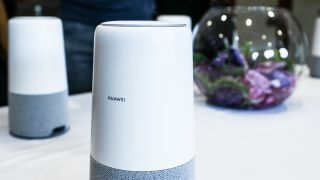 Huawei announces its AI Cube smart speaker with Alexa voice control built in | What Hi-Fi? Huawei is showcasing the AI Cube at IFA, its first smart speaker with Alexa voice control and 4G router built in. It seems a logical step for the Chinese company, which has been pioneering various uses of AI in smart phones, to enter the smart speaker market with a product that certainly on paper looks to be a contender. The AI Cube, which stands at around 22cm (and is evidently not a cube), is nominally a 15W mono speaker, though with a pair of passive radiators flanking its main driver for deeper bass response. Built with a 400ml sound cavity and aluminium diaphragm, it is clear Huawei has not shirked its responsibility for music playback even with its clear focus on AI. That extends to its proprietary audio technology, Huawei Histen, which seeks to further improve performance with features such as virtual bass, linear phase equaliser and adaptive gain control. Its use of Alexa is also aided by four microphones and Far Field Voice Recognition as part of the Histen technology. Setup for the router, meanwhile, requires only the addition of a 4G SIM card for high-speed connection at LTE Category 6 speeds, and is dual band, compatible with 2.4GHz and 5GHz and able to transmit data over LAN at up to 1,200Mbps. No pricing has been given as yet, so it’s difficult to see where the AI Cube will fit in, but it is expected to be launched later this year.